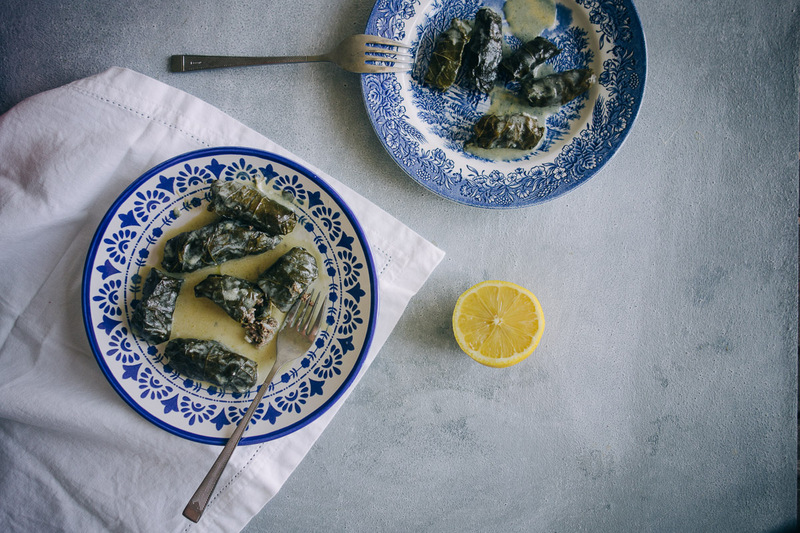 My dolmades recipe is the traditional recipe handed down by my father. I hope you enjoy it as much as I do. I don’t think I’ve ever met anyone who could resist the charms of a dolma! Otherwise known as stuffed vine leaves, these little packages of wrapped goodness are almost perfect. And there are a myriad of ways to prepare these beauties. Some are stuffed with rice, nuts and herbs, others with vegetables but today I’m showing you the version I grew up with and learnt from my parents. These dolmades are filled with meat, a little rice and a few herbs. Finished off with an avgolemono sauce (egg lemon sauce) they are distinctly Greek in my eyes. And yes. I know that many countries surrounding Greece have their versions and I enjoy those too! I have always affectionately referred to “dolmades” as “dolmadakia”. It’s just something that I have continued to do from my childhood. Walking home after school I could smell the distinct aromas of dill and mint from up the street! It was intoxicating! And it was not uncommon for me to gulp down about 25 of them in one sitting! 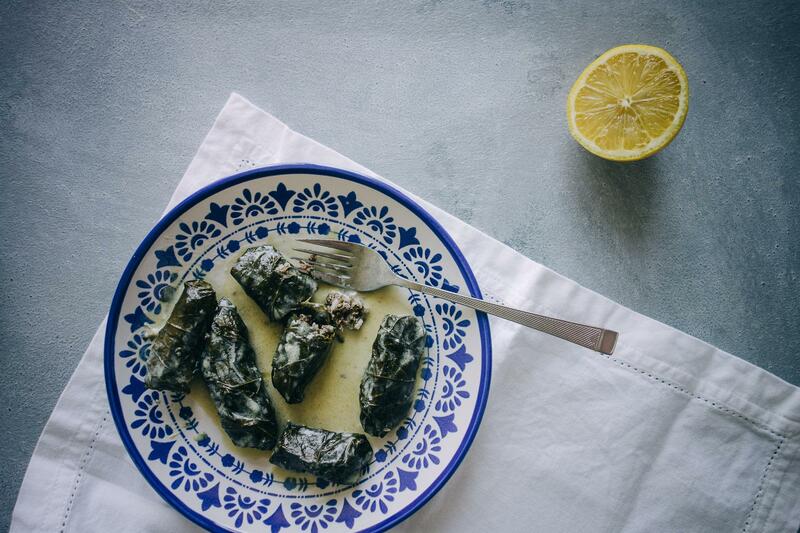 Regarding this dolmades recipe, I used brined vine leaves purchased at the local Greek deli. Be sure to rinse these thoroughly and let them dry before adding the meat stuffing. They do require a little effort to make. The biggest issue I had (and really, it’s not a first world problem) were the sizes of the vine leaves. Some were really huge and others tiny. So try to keep the sizes similar to ensure an even cooking result. Top the dolamadakia with avgolemono, serve with bread and fetta and get ready to feast. Trust me. You’re going to love these. Line the base of a medium to large sized pot with vine leaves and set aside. Combine the meat, onion, herbs, rice, olive oil and seasoning in a bowl and mix to thoroughly combine. To make a dolma, lay a vine leaf (stem side facing you) on a clean bench and place a tablespoon of the meat filling in the centre of the leaf, fold up the sides inwards and roll up into a neat parcel. Repeat for the remaining vine leaves until all the dolmades are completed. Stack neatly in layers (seam side down) in the pot you preppped earlier, drizzle with olive oil and place a plate (obviously one that will fit your pot!) on top of the dolmades. Place on a medium to high heat, add the ater and allow to cook for approx. 45 mins until the leaves are tender. Once cooked, beat the eggs and lemon juice and temper this mixture by adding a few ladles of the cooking liquid from the dolmades. Whisk thoroughly and add to the pot. Shake the pot a few times, allow to rest for 5 mins before serving.